After a brief break in the middle of the season, Sailor Moon Crystal returns with the 2nd story arc, Black Moon, as dedicated to the original manga as ever. With what the first half had to offer, there was much to expect from the quality already delivered. The quality is still there, but it loses its moonlit luster and becomes a little tired towards the season’s end. The repetitive nature from the previous 1990’s anime returned and in so doing, pulled the cork on Sailor Moon Crystal’s tighter story telling. 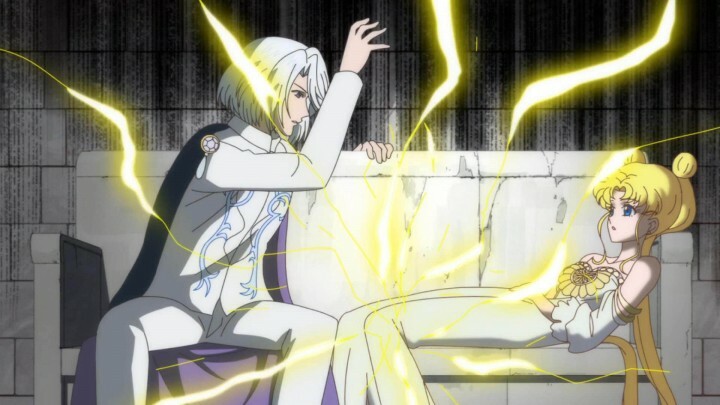 Despite this, take it coming from a Sailor Moon fangirl, there are still a lot of redeeming qualities in the season’s second story. Picking up mere moments after where we left off in Episode 14, Usagi, Mamoru, and the scouts are baffled by Chibiusa, who fell from the sky. Despite their suspicions, they still attempt to reach out to her. Considering what we find out later, it’s understandable why Chibiusa lashes out early on. 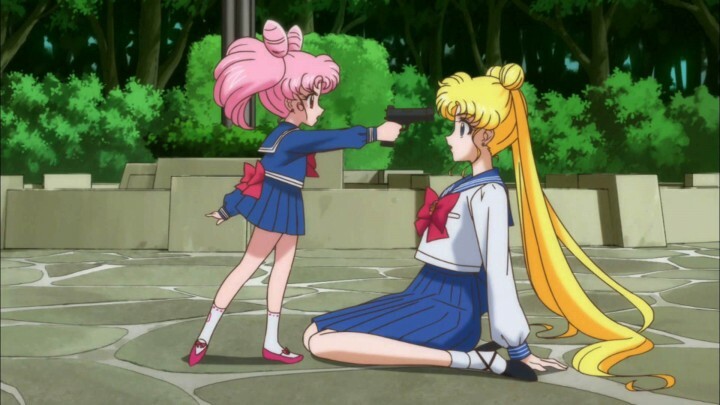 In the original anime, Chibiusa was spoiled and annoying whereas here her behavior is natural for her age and circumstance. We also meet the new villains for the Black Moon arc, led by Prince Demande, who seeks to steal the Legendary Silver Crystal (again!) for his own evil means (yes, again). This repeated motivation isn’t a crime, as this is what happens in Takeuchi-san’s manga and in the original anime. 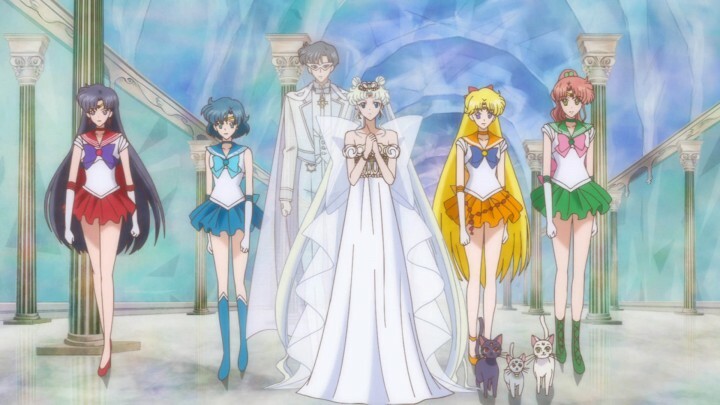 Sailor Moon Crystal continues to remain faithful in its adaption, which is a welcome relief. However, as a result, the pace is turned down to walking rather than the galloping momentum experienced previously. These episodes are particularly named after and focused on three of the scouts: Mars, Mercury, and Jupiter. Knowing this, there was the hope for deeper exploration of these characters and perhaps some of the fun that was lacking in the first half. We do get slightly more character development from each scout, but only just slightly. They are still watered down from the bombastic personalities presented in the original anime. They are all too friendly and stay as nice, absolutely perfect friends. Sailor Moon Crystal drops the ball in its consistency. When they battle the evil doers, this time around the scouts, aside from Venus, are totally useless. The story does require the three scouts to be defeated for the first turning point, however Sailor Moon Crystal drops the ball in its consistency. The first story arc had the scouts destroying youma (demons) on their own, only to be easily picked off in this arc despite new powers. It was literally going back to square one! Regardless of the rather flat start, Sailor Moon Crystal gets more intriguing here and has some of its best moments in this segment of episodes. 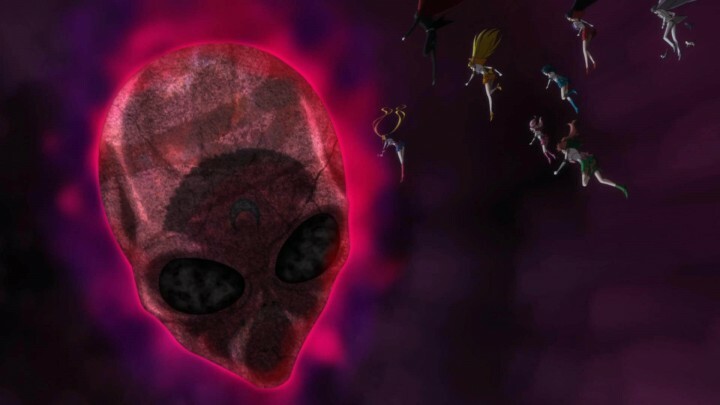 We get the exposition on where or rather when Chibiusa comes from and who the Black Moon Clan are. Chibiusa opens up and becomes more social including going to school. This changes after experiencing a Malefic Dark Crystal earring and fear takes over her again. To help her, Mamoru works on comforting Chibiusa, spending time with her and talking to her through a Tuxedo Mask doll. She responds to Mamoru well and feels comfortable with him. This in turn makes Usagi oddly jealous but still wanting to help Chibiusa. Noticing this, Mamoru comforts Usagi and, in my mind, a rather controversial implication is made as to how he comforts her. Admittedly, I know this takes place in the manga, however I still think it’s an inappropriate act considering Usagi’s age of 14. Sailor Pluto is a huge highlight. 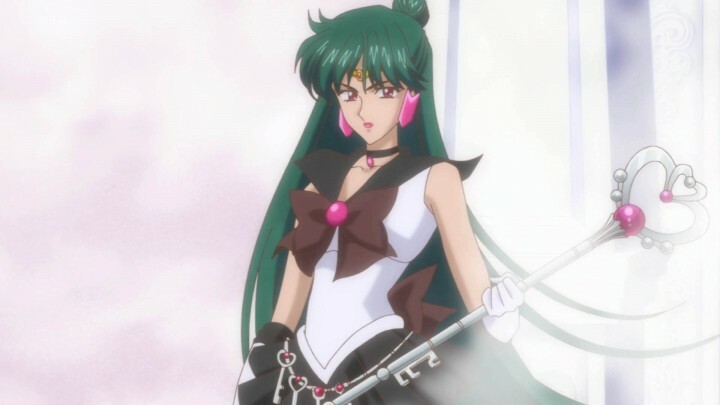 Sailor Pluto, the first of the Outer Senshi to make an appearance, is also introduced and for a change, is a more developed character than her previous 1990’s anime version. 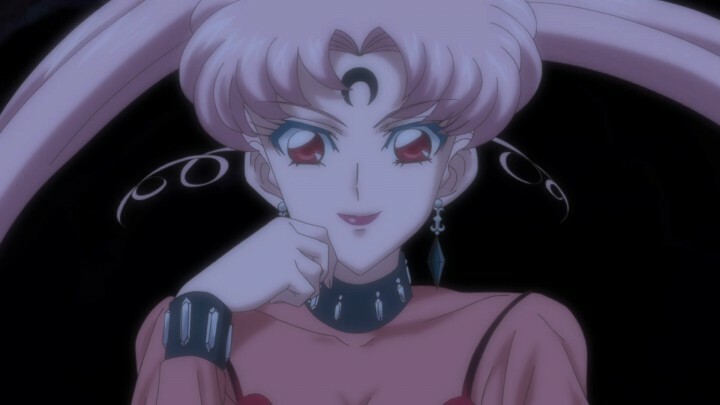 Pluto is a huge highlight; she’s part badass solitary guardian, part substitute mother figure for Chibiusa. Pluto and Chibiusa are two lonely souls who found each other and fit well together. Pluto’s backstory is tragic and she easily has the most difficult duty of the scouts shown in the series to date. There are also a few noticeable changes in how Sailor Moon Crystal portrays some settings differently from the 1990’s anime. The time-space zone is animated differently in this version, with clouds rather than the rainbow swirls and vortex look of the original anime. Again, a reflection of Sailor Moon Crystal keeping up with Takeuchi-san’s manga artwork. Additionally, 30th Century Tokyo is portrayed as more of a technological futuristic city rather than taking on the Moon Kingdom design cues in the original anime. I feel that this is a step better as it would be more likely that Tokyo would continue to be a technological hub even with the Silver Millennium family in power. The season takes a slide here with the Black Moon Clan and planet Nemesis. You get their side of the story, but their motivation is sloppy. Luckily, there’s Wiseman, who’s much like that of Queen Metalia from the first half, being the real evil source. 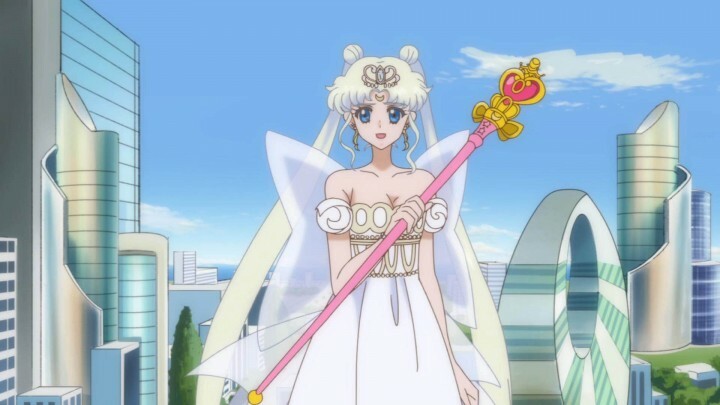 Wiseman’s story is better explained than the aforementioned clan; he’s a bitter enemy out for revenge against Neo Queen Serenity (that’s future Sailor Moon) and was exiled to Nemesis for his crimes. Demande makes you hate him, which is what you want from a villain. Prince Demande takes the lead for these episodes as does Usagi. Demande has quite the attraction to Neo Queen Serenity and can be seriously creepy. There are unnerving implications for what Demande can and will do to Usagi, if she doesn’t escape him and the planet Nemesis. As a result, I felt like Usagi was in immediate danger for the first time this season. Demande makes you hate him, which is what you want from a villain — so when he does finally get his, you can cheer. The Black Moon Clan, on the other hand, have an ensemble that would be more interesting if they were allowed to develop. That’s the main issue with Sailor Moon Crystal: the storytelling is generally tight, but it sacrifices time for getting to know any of these characters. They’ll literally say a couple of lines an episode and then eventually meet their demise, leaving the viewer somewhat numb from not caring. The Black Moon Clan are ultimately just bad kids who went even more wrong by joining with Wiseman. Speaking of Wiseman, he starts to show his true darkness here through the manipulation of Chibiusa for his own means. We get more insight into Chibiusa’s perspective on the things going on and her life before the Black Moon Clan attacked 30th Century Tokyo. Unfortunately, this leads to an awakening for her and that’s not good news for our heroes. Even with knowing what’s going to happen next, these episodes were enjoyable. They setup the real gravity of the situation the protagonists are in, despite the amount of toing and froing in conversations and a lot of exposition being repeated. 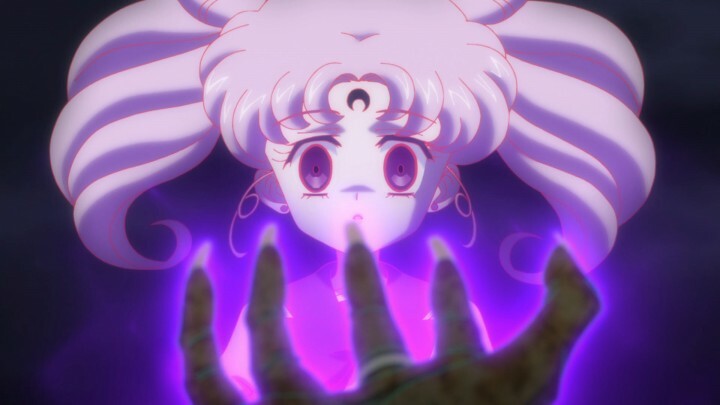 As with what’s come before in Sailor Moon Crystal, we find our heroes in their final standoff with Wiseman, the Black Moon Clan, and Chibiusa transformed into Black Lady. 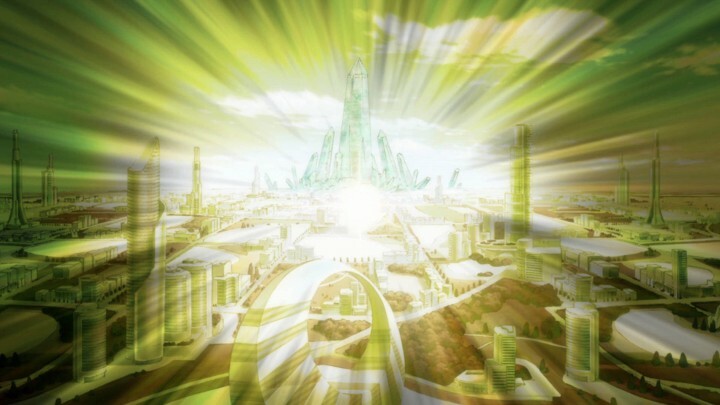 The villains are committing their final assault on 30th Century Tokyo and the “beautiful planet”, stabbing the world with Malefic Dark Crystals. Interestingly, the final showdown is not simply a battle of powered up crystals, but also a psychological battle for Chibiusa’s mind. This adds a new dimension to the typical climactic fight and is welcomed viewing. Black Lady isn’t redeemed by the usual tropes either, which makes for a more logical resolution than the previous 90’s anime. Disappointingly, the scouts, aside from Moon and Pluto, are completely helpless and stand on the sidelines. This battle is really Pluto’s time to shine. She again is the real highlight here, and shows true courage in breaking the taboos of her duty by joining the fight. She already sacrifices much for the Silver Millennium family and still pushes on, proving that love conquers all. She may not deliver the final blow, but she sure as hell makes a big difference. This final fight doesn’t continue to deliver that same sense of threat or danger conveyed in previous episodes. It wasn’t as impacting as it should have been and it’s difficult to directly point out what causes this emptiness. It could well be that I’m too familiar with the material and feel that it’s all been seen before, but then there were lots of moments in the whole season of Sailor Moon Crystal where I didn’t feel that way. Demande doesn’t appear as threatening as before, but this could be more to do with Wiseman’s “true” form taking center stage. The second half of Sailor Moon Crystal gave me some mixed feelings. The character development issues still continue and the return to making the scouts less formidable is displeasing. Sure, Sailor Moon should be powerful, but it does contradict the premise of the scouts protecting the Moon Princess in the first place. Why does she need their protection, if she’s so powerful in her current form? Luckily, Pluto is a most formidable scout, with time-space powers so everyone’s existence depends on Pluto to perform her solitary duties. Pluto’s character development was a vast improvement on her previous anime incarnation as was the vile Prince Demande. It’s a shame that the other scouts are still yet to be improved upon, however there are still three story arcs to remedy this. I would like to see Sailor Moon Crystal have a few fun episodes that can be based on the short stories from the manga volumes, which would still be keeping faithful to Takeuchi-san’s vision but would also provide the opportunity to pay tribute to the original anime’s humor and a chance for the scouts to be further developed. Sailor Moon Crystal, viewed as a full 26 episode season, gets through the first two stories clearly and crisply following exactly how Takeuchi-san executes them in the manga. In doing this, the series forgoes all other previous incarnations in media as if it forgets part of its own legacy. Though I enjoy the magic Sailor Moon Crystal offers as one version of this legendary magical girl tale, it isn’t the one to outshine them all. At least not yet.